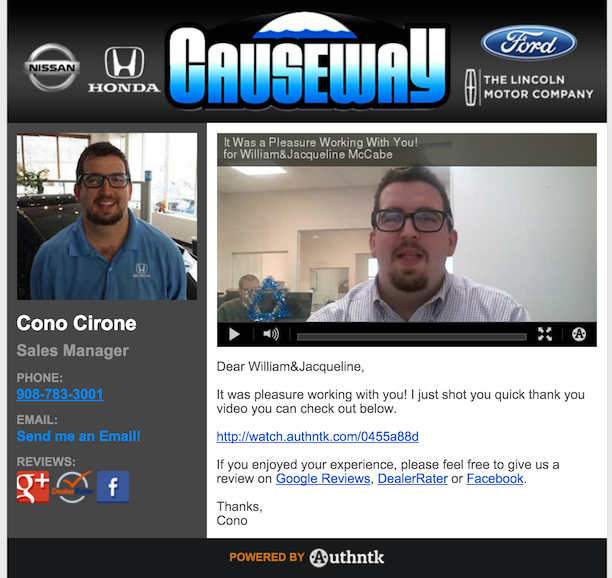 Congratulations to Cono Cirone of Causeway Honda! The short, engaging video he created, using Walkaround Videos, has been selected as our Video of the Month! As Cono’s video proves, using Authntk Walkaround Videos is a great way to connect 1:1 with the customer by sending unique, personalized video messages that stand out, even AFTER THE SALE! What is Cono doing that YOU could be doing? It’s called a post-sale video. Creating a post-sale video is a new strategy for a lot of dealerships using Walkaround Videos. It’s a short video from you to the customer, following up with a personal touch and asking the customer to give you a review. Big smile. Friendly wave. Lavish praise for the banana bread they shared. It’s all there! This is powerful stuff! The video is short and sweet, but the authenticity and Cono's personality shine right through. A lot of customers have great intentions to leave you a review, but when they get home it just slips their minds. This is a great, unique and personal reminder. And here is the coolest part... This is what Cono’s email to the customer looks like. You can see that the hyperlinks will link directly to the dealerships review sites. You can't make it any easier for them! What will YOU do to amaze customers and prospects, and invest in your long-term relationship with them? Visit WalkaroundVideos.com to learn more, or take a free test drive today.